Every now and then, Oracle Discoverer (10.1.2) throws a tantrum saying that the “Hard limit on the number of sessions” has been reached. It gets particularly annoying when this happens during the middle of the week and we are left with no choice but to schedule a downtime and restart the services. The number of sessions is specified in the opmn.xml file and it also there that the parameter can be edited to a desired value. Thought this by no means is a solution, it greatly reduces the frequency of occurrence of this error. Recently, I’ve tried to monitor the number of sessions, which could help me predict when the limit might be reached and therefore schedule a restart during an off-peak time beforehand. 3. The number of sessions as shown in the Oracle Enterprise Manager Application Server console. Each of these produces a different value, however all of these values show an increase / decrease when a new session is opened / closed. Which of these values would be more likely to hit the limit specified in the xml file remains to be seen. Once verified, a script can be created and scheduled to restart the services automatically. The idea is to create a Link between a ‘source’ database and a ‘target’ database so that, the client is able to query from the target, without having to configure the additional network connectivity. This is especially useful when there are many ‘targets’, plus many clients involved which would be a hassle to for example, edit the tnsnames for each client with individual entries for each target. Instead, The tnsnames for all targets can be added in the source database and then a link may be created between the source and each of the targets. The client can then run a query normally, and by simply appending an extra word (dblink name) is able to query the target for which that link had been created! Linking from an Oracle db to a non oracle db essentially involves using Heterogenous services, which is included with the database installation. For 10g and below, the program is ‘hsodbc’, and for 11g it’s ‘dg4odbc’. It can be found at $ORACLE_HOME/dg4odbc. Firstly, the ODBC driver for that target db needs to installed on the source machine. In this case, the source Oracle db ois on a unix machine. The host OS of the target dbs is … irrelevant. 4. There are a number of prompts, most of which can be defaulted. At the software installation directory however, specify the path for the ODBCHOME directory. 5. When prompted for a Key or a Serial Number, enter ‘EVAL’ for the trial version. 7. This file is where the connection information is configured for each target. For starters, there’s two headers – [odbc data sources] and [Name of the data source]. There’s one example data source under the first header, and the list of parameters under the second. 9. Note the second header i.e. parameters for the data source. A separate header is defined for each target, with the header name being the data source name as defined earlier. 10. Edit the parameters for the target databases, specifically the database name, ip address, port, username and password. That was only the tip of the iceberg. For the next part, the listener.ora and tnsnames.ora will be edited to include these newly created data sources. To do so, dg4odbc needs to be invoked. 13. Reload the listener for the changes to take effect. Note the (HS=OK), which is required to enable heterogeneous services. 16. In the $ORACLE_HOME/hs/admin directory, a few sample init files are included, such as initDG4ODBC.ora. For each data source, an init<SID>.ora file needs to be created and configured. 17. In this case, create a new file init<SID>.ora or copy an existing init.ora file and rename it. 18. Edit the parameters, specifically the first one i.e. HS_FDS_CONNECT_INFO. This parameter must be assigned the Data source name as the value. 19. Optionally, add any environment variables in the same init file. Finally, creating the database link itself. Presto! Works like a charm. 1. Download the Installation packages from the Oracle Software Cloud and unzip into a single location. 3. Specify the installation directories and proceed to select components to install. Foundation services is mandatory for any of the other components as a single, shared infrastructure. More on Foundation Services here. While installation in this case is only so much as extracting the components from the packages, configuration is the part where the individual components are made ready to use. Note: The Foundation Services must always be configured first, followed by the other components. 4. Verify the changes and ‘Finish’ the installation to make them permanent. 7. 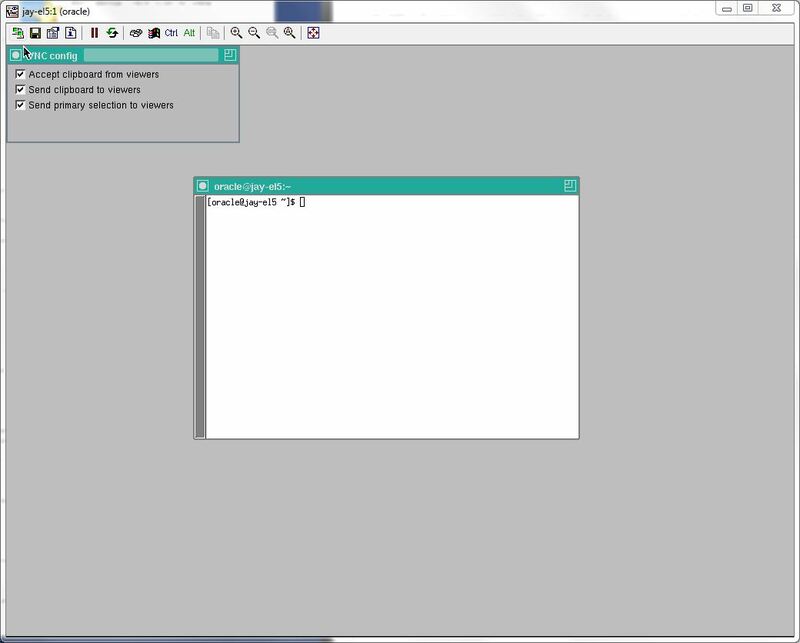 Once the ‘Running’ status is displayed, the weblogic interface can be accessed from the browser using the URL specified at configuration. One of the many perks of virtualization is the amount of resources it saves for an enterprise – power, cooling costs, physical space and maintenance staff. A single server supporting Ten Virtual Machines is often easier to maintain and costs less resources than Ten different Real Machines. Setting up the VM Manager is simple enough. Insert/mount the CD media to a server and run the installer. 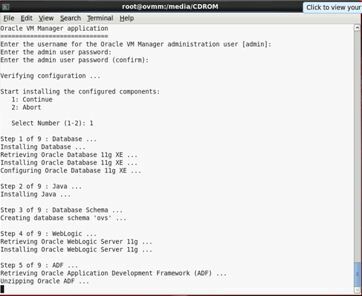 Setting up the VM Server(s): On each machine, insert/mount the Oracle Virtual Server CD media and proceed with the installation. Note: The IP address and the host-name can be set manually for ease of access. Add a select number of VNICS (Virtual Network Interface Cards) by specifying an IP range. Each one is identified by an IP address, which can later be assigned to virtual machines. * An issue may be encountered at this stage, possibly due to a faulty template. To address issues with VM templates, locate the file titled ‘vm.cfg’ specific to the template on the NFS Share and modify the parameters as needed. For Database Installation on a Virtual Machine Disk, It is recommended to set the Virtual Disk type as dynamic for optimum disk usage. Oracle recommends a minimum of 1G system memory. However, atleast 1.5G is necessary to have enough resource for both the Operating System processes as well as the Database processes. A database installed on a system with insufficient memory or improperly specified SGA/PGA may cause errors at Startup such as ORA-27102: Out of Memory. The system hostname by default is ‘localhost.localdomain’. This can be changed before installation, or by editing /etc/sysconfig. It is recommended to do this before the Database Installation so as to avoid complications. In order to create a partition on an existing partition or volume, use pvcreate / lvcreate. +DATA diskgroup should have a minimum of 4G space available, or the database cannot be created. Note: The installation had been done for a single node cluster. 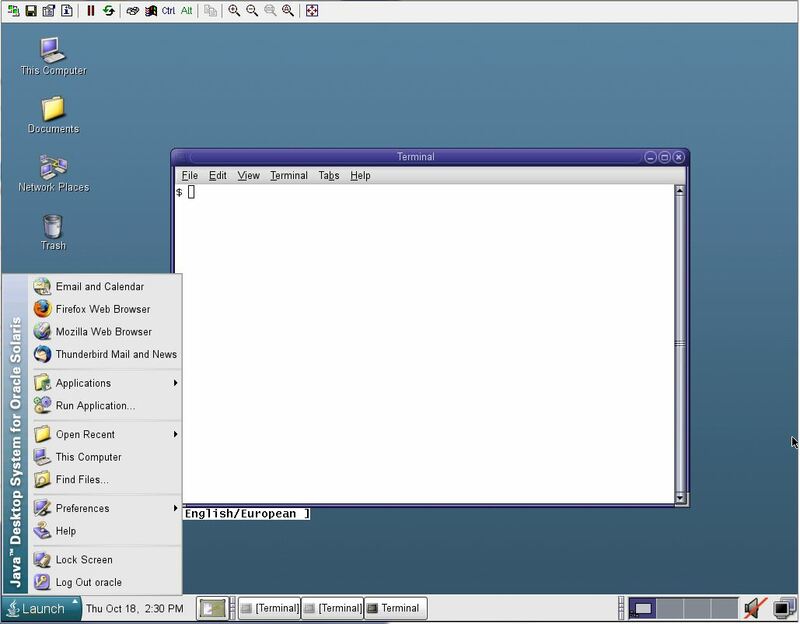 Additional unix packages can be downloaded from the internet and copied across. Unfortunately, it is not possible to update the OS as it is a host-only network. The Database Software and the ASM instance have been setup. The final stage post installation is to create and configure a database. 5. Storage options > Specify ASM and select the +DATA diskgroup. Subsequent Database management tasks can be accomplished either on the Enterprise Manager console or in SQLPLUS.